“It's A Set Back, That's All.” COMICS! Sometimes No Face Is So Stony Time Cannot Erode It! Potential readers might be feeling put off at this point by the implied weight of history but they shouldn't be. 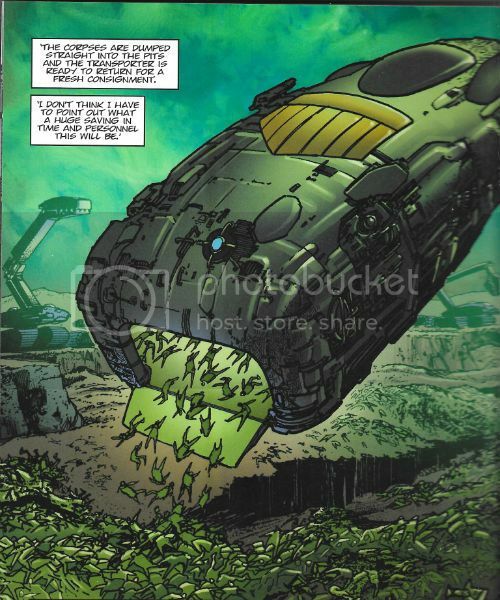 John Wagner wrote these books and John Wagner has been the main Dredd architect for longer than most of you have been alive. Age has not withered him. In short, John Wagner knows what he's doing. While the scope and severity of the events which unfold are impressive and horrific indeed, it's worth acknowledging both the quiet efficiency with which Wagner builds his story and the new reader friendly way in which he does so. In no time at all the essential information required is slickly delivered to the reader's mind via their eyes (the previous Chief Judge is in penal servitude; the new Chief Judge seems reasonable; Dredd is bored on The Council of Five; the Mayor turned out to be a serial killer called PJ Maybe; mayoral elections are imminent; and a scientist who has invented something very nasty indeed is being sought by certain someones with mischief in mind). It's a lot of plates to keep spinning but Wagner does so magnificently, slowly zooming in on certain events as other events recede and then adroitly shifting emphasis to keep the story interesting, intriguing and trucking implacably along to an an ending which may be inevitable, but never once seems predictable. His characters all possess some, and are defined by actions and words so economically it's easy to miss the skill involved. There's a lot of skill involved is what I'm saying there. It's called DAY OF CHAOS so no high fives for knowing where it's all going (it's going to go badly; the only question is how badly is it going to go) but fascinatingly Wagner goes to incredible lengths to put the inevitability of it in doubt. His genius move is in loading the dice in the Judges' favour. 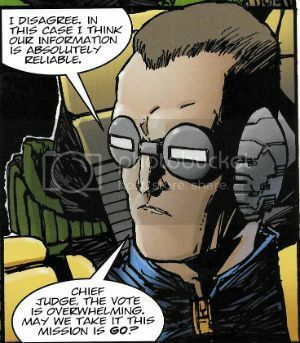 They have a psychic who is on the (crystal) ball, they have Judge Dredd, the new Chief Judge is a reasonable man, well, what could go wrong! Quite a lot of things as it turns out. But the crux of the Judge's f*** up, the pivot around which all the pain revolves is so brilliantly simple and so damning of The System I actually barked with laughter. Things go badly for a bit, but they are what someone with the soul of an ant might call “within acceptable parameters”. And then...oh, dear. (4) Waging a War on Terror turns out to be trickier than the Judges' might think. After all you can't shoot Terror in the face. Fear, Fire and Mortis on the other hand are a different matter. Yes, the three Dark Judges turn up (Death's AWOL) but Wagner uses them more to reflect the extent of the stakes than as a threat in themselves. Usually a Big Meg shaking event in their own right, here they are just the cyanide sprinkles that adorn this dish of revenge; one served very cold indeed. DAY OF CHAOS is so dark that The Dark Judges act as something of a respite, that's how dark this one gets. (It's quite dark, are you getting that?) 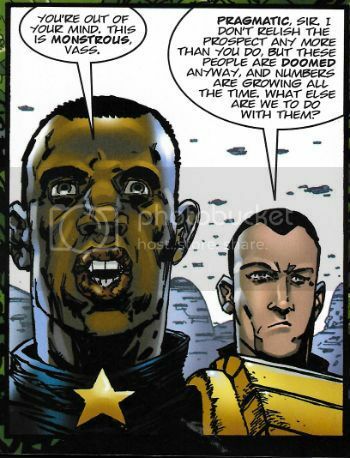 This is an attack on a Mega City and the deaths incurred are Mega-Deaths. After all the comic book universes which have died without a drop of blood, just a timorous winking out of existence, it's bracing and, yes, shocking to see so many dead. The business of death is a horrible business and DAY OF CHAOS never lets you forget it. By the time you get to the bit about the key under the door you'll be so starved of light that one simple act of humanity will blind you. Because despite all the sturm und drang, all the body pits, all the betrayals, all the torture and the serial killers and the dead, the dead, the dead, oh, the dead, John Wagner never forgets the humanity which makes it all bearable, which stops it al from being pointless. DAY of CHAOS is entertainment but it's also grueling stuff and as weird as that may sound entertainment-wise it's far less weird and far more honest than the weightless extinction of entire civilisations which at most cause Spider-Man to cry a tiny spider-tear. By necessity, as these episodes originally appeared weekly, the art for such a long form tale is by diverse hands . Cunningly they've kept the team to a minimum and the main story is handled by Willshire, MacNeil, Gallagher and Flint. Each of whom is a talented artist and so have unique styles, but there (sensibly given the intense density and extended duration of the epic) seems to be some attempt to conform to a base level of consistency, so that confusion is kept to a minimum but, crucially, some sense of individuality is also retained. Everyone on these pages is great, bringing solid skills to the service of pages packed with detail and information which, in lesser hands could have been inert and dull. It would be rude to pick a favourite, but luckily I am a rude man so, in a close contest Henry Flint wins; he does so purely because his style so strong and he finds room to unobtrusively include playful visual quotes from Frank Miller at least three times - the Prague enclave's architecture is straight out of RONIN; a bed in a hotel is the “heart” bed from SIN CITY; and his ladies lips are HELL AND BACK lips if ever I saw 'em. Dave Taylor and Edmund Bagwell provide art on a couple of post Chaos Day tales and the cleanliness and lightness of their approaches act as a welcome respite from all the darkness prior. Did I mention DAY OF CHAOS was dark? I know I forgot to mention it was VERY GOOD! Now, I believe the two volumes above have been recently released in North America in TPB format, but that's not the format I read them in. 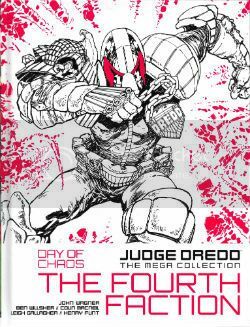 No, because I am Special my books form part of the Judge Dredd Mega Collection partwork (4) published by Hatchette/Rebellion. 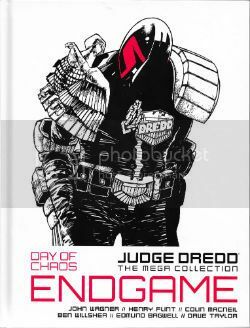 This is a proposed 80 hardback volume set of reprints of Judge Dredd strips, each fortnightly volume being organised by theme/storyline. They are not released sequentially - the 49 and 50 refer to where they will fit in the final collection. Anyway, this Judge Dredd Mega Collection has settled in at £9.99 an issue. 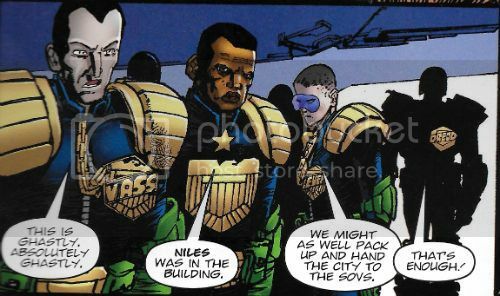 And as I say, they are hardbacks, which is always nice, and they have a uniform trade dress with the spine building up a picture of 2000AD characters (rather than just Dredd characters for some reason; also this makes it hard to find a particular story, but I think if that's the most pressing of your concerns you are blessed indeed). None of them have fallen apart yet and despite the paper smelling like you suspect that bloke who fell in the radioactive waste at the end of Robocop did (i.e all chemically), everything seems sturdy enough. Obviously the newer stuff reprints better than the old stuff but them's the breaks. I'll be sticking with the series as long as I can and if you want me to look at any of the other volumes let me know, I'm only too happy. Actually, happy might be a bit strong. Not unopposed to the idea, say. Or I might do it anyway. Let's be straight here, I'm not your slave, pal! But I am a slave to – COMICS!!! (1) No evidence has been found to back up the fact that this is indeed an ancient Chinese curse. The source seems to have been mistranslation, or invention, on the part of Westerners resident there. Still a nifty saying though. Gremlins are real though, right? (2) Judge Thoreau would likely have been expelled from The Academy of Law after the first semester and strongly encouraged to take his fancy schmancy ideas with him on The Long Walk; bringing law to the lawless in the Cursed Earth until death. (3) Winningly, it has completely slipped the Sovs' collective mind that they initiated the Apocalypse War and the truth has become twisted so that they are now the victims. 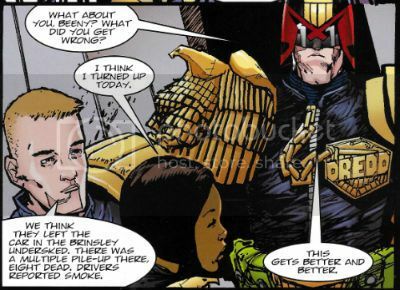 I'm not entirely unsympathetic, Dredd went a bit far but, y'know, you get in the pit you got to face the bear. If it gives you a bloody good mauling it's on you. (4) See, it's okay getting away with all these allegedly illegal wars and allegedly illegal drone killings and giving yourselves an 11% pay rise then voting for a Benefits Cap and selling bits of us to China and demonising the poor and allegedly sticking your bits in dead pigs mouths but what they forget, what they always forget, is one day they might need We, The People to trust them. And that trust just isn't going to be there. Because no one ever gets away with anything. (Except whoever did for Red Rum, obviously). (5) Partworks have experienced a resurgence of late but they were a staple in the 1970s when it would be possible to build, oh, say for instance, a replica of Hitler's skeleton by purchasing 206 fortnightly volumes. The first volume (Hitler's skull) would be offered at a knock down price, the second volume (Hitler's femur, say) at a slightly higher price, with the regular price kicking in around the third volume. Eventually part work fatigue would set in as people would get tired of paying for each of Hitler's vertebrae and the series would quietly disappear from the newsagents. In the 1970s a cardboard box containing an unfinished Fuhrer skeleton was a staple of most homes. At least that's how my dad explained those bones in the back of the cupboard that time. In retrospect, thinking about it now, I'm having my doubts about my Dad. He was away from home a lot...Oh.